Rep. Colleen Hanabusa campaigning for U.S. Senate in Honolulu on Monday. I don’t know who is going to win Saturday’s special Democratic Senate primary between Sen. Brian Schatz and Rep. Colleen Hanabusa — and it’s not just because there’s a lot going on in Hawaii right now (an earthquake rattled Hawaii on Thursday, and two tropical storms are on course to hit or come near Hawaii in the next five days). Instead, the polling picture in the Aloha State is a mess. One poll has Hanabusa up by 8 percentage points, and another puts Schatz up 8 points. Why the discrepancy? Hawaii’s diversity has troubled pollsters in the past and looks to wreak havoc in 2014. Unlike in most states in the continental U.S., the majority of Hawaiians are non-white. Native Hawaiians, people of Asian descent and those of mixed origin make up about 70 percent of the state’s residents. People of Chinese, Filipino and Japanese descent make up the vast majority of Hawaiians. Hanabusa, who is Japanese-American, and will try to replicate the coalition put together by her mentor, former senator Daniel Inouye. In 2012, Inouye asked Democratic Gov. Neil Abercrombie that Hanabusa be appointed to his seat upon his death. When Inouye died a few days later, Abercrombie decided instead to appoint his lieutenant governor, Schatz. 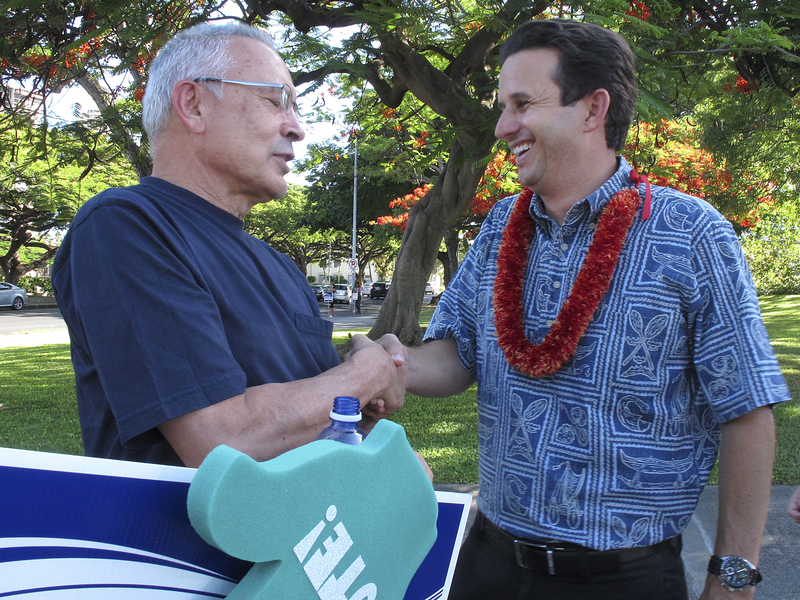 U.S. Sen. Brian Schatz, right, greets a supporter during a campaign event in Honolulu in July. Schatz, like Abercrombie, is white. Indeed, the battle between Schatz and Hanabusa can be seen as much as a battle between Abercrombie and Inouye. Inouye had encouraged a primary challenge to Abercrombie in the 2010 gubernatorial primary. But the Abercrombie connection could prove problematic for Schatz. The two major polls in Hawaii, the Hawaii Poll by Ward Research and the Civil Beat Poll by Civil Beat, with help from the Merriman River Group, have Abercrombie down by double digits in his re-election campaign. Yet Schatz is running ahead of Abercrombie in all racial groups. Schatz is outperforming Abercrombie overall by 18 percentage points in the Hawaii Poll and 10 points in the Civil Beat survey. That could be, in part, because Schatz has endorsements from the Democratic Senatorial Campaign Committee and native son President Obama. Obama won Hawaii by 43 points in 2012. Still, the racial divide is evident in the polling. According to both pollsters, Hanabusa is cruising among Japanese-American voters and doing quite well among Native Hawaiians and voters of mixed origin. Schatz, on the other hand, is sweeping white voters. Everyone agrees on that. The pollsters split on who is winning in the Chinese and Filipino communities. But what’s throwing the polling off most is the expected racial makeup of the electorate. Both pollsters agree that 27 percent of primary voters should be of Japanese descent, and that Asian-Americans should makeup about 42 to 45 percent of primary voters. They disagree wildly, however, on the percentage of whites. The Civil Beat Poll has whites at 43 percent of the electorate; the Hawaii Poll pegs them at just 22 percent. To state the obvious: That’s an astounding difference. The Hawaii Poll largely makes up for the lower percentage of white voters by having more Native Hawaiian and mixed-ancestry voters. But because Native Hawaiians and those of mixed ancestry are predicted to vote quite differently than whites, the divergent racial makeups between the two polls leads to the Civil Beat Poll putting Schatz up 49 to 41 percent and the Hawaii Poll giving Hanabusa a lead of 50 percent to 42 percent. If one were to apply the the racial makeup of the Hawaii Poll to the Civil Beat poll, Schatz’s 8-point lead becomes a 3-point deficit. So, whom to believe? I’m not aware of any reliable statistics on the racial makeup of Hawaii’s Democratic primary voters. The state and outside groups have done a terrible job at keeping records on who votes and who doesn’t, as then-National Journal writer Steven Shepard documented. Indeed, polling any non-presidential primary is tough. As my colleague Nate Silver found in a study of polling from 1998 to 2010, gubernatorial and senatorial polls taken within three weeks of the election were off by an average of 7.8 percentage points. The accuracy of past Hawaii surveys also doesn’t provide us with any clue. The Hawaii Poll missed the 2002 gubernatorial primary by 18.6 percentage points because it underestimated the white candidate. For the most part, it’s been better since then, but who’s to say it’s right in 2014? The Civil Beat survey missed the 2012 senatorial primary by 17.5 points because it overestimated the white candidate. (The Merriman River Group said it switched its voter-list file and expects more accurate results this year. There is some thought that Asian-American and especially Japanese-American voters are less likely to be honest with a interviewer and break late for the traditional Democrat (i.e. Hanabusa in this election). The problem with that argument is that the Hawaii Poll is conducted by live interviews and finds Hanabusa in stronger position, while the Civil Beat is done with an automated voice and puts Schatz ahead. Therefore, it’s not clear which poll be right Saturday. The only thing we can do is wait for the results. What a novel idea.